If you're anything like us, there's probably a digital notepad on your phone filled with odd strands of ideas, bizarre thoughts and reminders to buy milk. When it comes to setting reminders or taking notes, the smartphone feels like the easiest way to do it, especially when you're out of the house. But a company called Senstone has come up with a new way for you to capture those thoughts throughout the day, which doesn't require you reaching into your pocket at all. 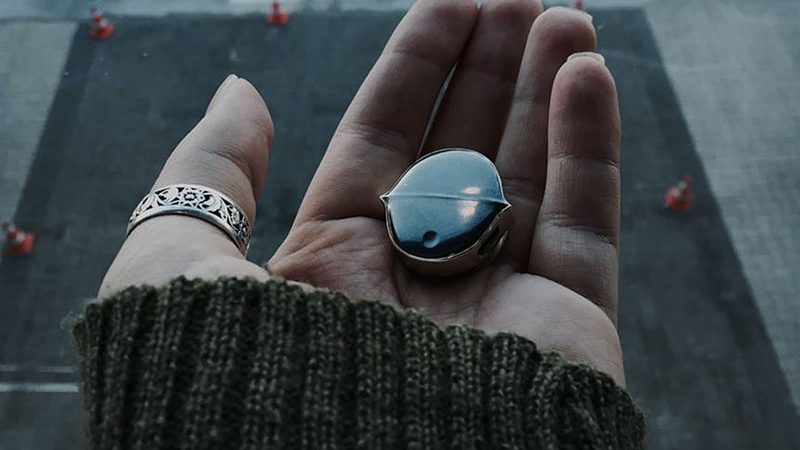 It's still a work in progress, but the Senstone smart pendant is an intriguing device that records voice memos, automatically organises them for you, and translates them into text. Read next: Wearable sales are huge, but who's actually buying it? The pendant can also be worn as a bracelet or necklace, designed to look like a piece of jewellery. A small LED inside lights up to indicate it's recording, but other than that there are no giveaway signs that there's any technology in this at all. Founder Nazar Fedorchuk told Wareable that there are some ideas it's still looking to implement before the final device is ready. Right now, you need to tap the device to start recording, but the creators are working on a way to record by clicking your fingers. Once your sound bite is done, it will sync with your phone where the app will file it with the rest of your recordings, organised either by the location they were taken or the keywords you assign. They can easily be shared outside the app, too. If your phone isn't nearby, you can record up to two hours of audio on the device's memory, which automatically unloads onto your phone (and wipes from the stone) when paired. Work has been done on the mic to make sure it focuses on your voice and does its best to block out background noise. We got to play with an early prototype, and our favourite thing about the Senstone isn't the recording itself but how it organises audio files and converts them into text. The accuracy was pretty good, but we only had a quick test and we'd want to spend a few days with it to see how reliable it is in the long term. Senstone is using its own software for the organisation part, but for voice conversion it's still trying out different options to find the most accurate, including Nuance and IBM's Watson. Fedorchuk said the device has been a year and a half in development, with pre-orders currently open on the site. But he told Wareable the plan is to launch a Kickstarter this November, with a goal of raising $50k and a shipping date currently aimed at Spring 2017. [Update: Senstone tells us it's postponed the Kickstarter to January]. We like the idea of being able to jot down thoughts without getting out our smartphones, although we're not sure how many people would pay to do so. The speech-to-text conversion does make it niftier though, and the design is nice. We'll be giving this a test at the first possible opportunity.